Sir Leszek Borysiewicz, Vice-chancellor of Cambridge University visited the NCBS and inStem campus on the 16th of September. Sir Leszek, accompanied by a senior Cambridge delegation also took time to interact with researchers on the campus. The visit served to reinforce several existing links between the campus and the University of Cambridge, and to commemorate Sir Leszek's instrumental role in fostering links between the institutions during his Vice-chancellorship. "I am delighted during Sir Leszek's visit to showcase the technology platforms developed in the Centre for Chemical Biology & Therapeutics, and to highlight the scientific achievements made since the Centre's inception. Research in the Centre is focused on addressing the scientific challenges that impede the discovery of new drugs for human diseases, an area of great importance in both India and the UK. 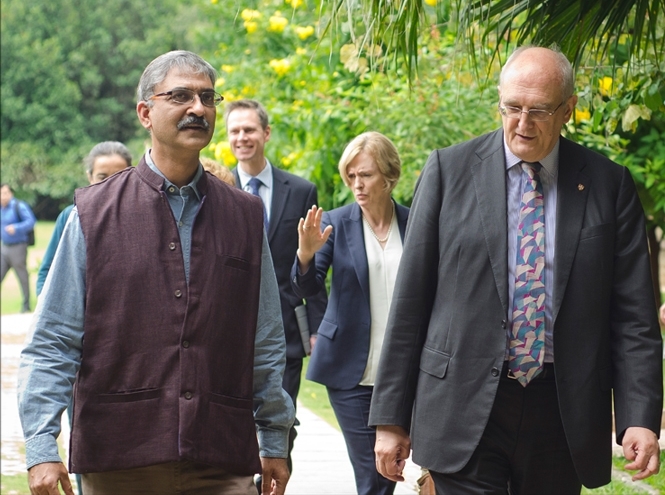 The Centre exemplifies the tremendous potential for collaborative research between Cambridge and India, and we are greatly indebted to Sir Leszek for his unstinting efforts to promote Cambridge-India links." said Prof. Venkitaraman. "We are very happy that Sir Leszek has returned to our campus, and that the collaboration between University of Cambridge and inStem and NCBS that he worked so hard to put in place, is bearing fruit. The huge potential with which the CCBT was set up, backed up with substantial funding from the DBT and a very well articulated plan by Prof. Venkitaraman are tasting success. We hope to have major breakthroughs in identifying small molecule targeting hitherto targets considered undruggable in cancer therapeutics. The Cambridge NIC post-doctoral programme is also something we owe a lot to Sir Leszek"
said Prof. Satyajit Mayor, Director NCBS and inStem.